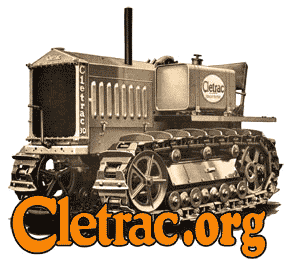 Cletrac.org > Cletrac Website / Forum Discussion > Cletrac Website / Forum Discussion > Thanks, Blake! Just wanted to thank you for your dedication to the site. It takes a fair bit of work to keep something like this rolling, and to straighten out the odd snag like last week's, and you probably don't get the credit you deserve! Well thanks Jack! Appreciate that. Yes, it is sometimes a lot of work, especially when something goes wrong, but I enjoy providing a medium to help folks out. I also do it in dedication to my grandfather. I just wish I remembered half of what he taught me! I'll second that! For those of us, who are new to Cletracs, this site is indispensible. Keep up the good work. The historical, and educational value of this site, cannot be overstated. Thanks! Derek. Merry Christmas, and Happy New Year!! Here Here , Good on you blake . Sadest part is the photos from the earlier posts won't be able to be matched up again . WE current members can go back and repost , but members that have moved on leaving their little piece of forum history wil be lost . Sad . Maybe Blake can put them into an Extra Album on the forum and some of the old hands with good memorys may be able to place them back to the old posts . I Don't know if it is possible and have no idea if it is unrealistic , Just a thought and suggestion . Ian . I was able to save most of them, but the file names are different. I'll try to put them all into a folder and let you guys go through them. You can copy and paste them to your computer and then go back and modify (new word for edit) you old posts and put them back in. But please tell me after you do it so I can remove them from the folder so the are not taking up space on the server. I edited and put all the "lost" files up at http://cletrac.org/lostpics/ - if you had posted pictures in your previous post that were "lost" when we moved to this new forum, please visit and spend some time at this page to see if your pictures are there. If they are, you can download them to your computer and then go in to your past post and click on "modify" and put the picture back in. Once you download your pictures, PLEASE LET ME KNOW WHAT FILES YOU DOWNLOADED SO I CAN DELETE THEM FROM THE SERVER.